Chronic obstructive pulmonary disorder is one of the leading causes of death worldwide and is characterised by chronic bronchitis and/or emphysema. It’s a progressive disease that requires a range of treatments, depending on the severity, or defined stages, of the condition. Smoking and exposure to high levels of pollution or toxic gases are the primary triggers of chronic obstructive pulmonary disorder. There’s no known cure, but medical intervention and lifestyle changes can improve quality of life for people living with the disease. In addition to medication, a balanced diet and annual flu and pneumonia vaccinations can be helpful in maintaining optimum lung function. Also, periods of rehabilitation, involving multiple disciplines, can enhance patients’ physical and emotional wellbeing. Due to the severity of the disorder, the state has classified chronic obstructive pulmonary disorder as a chronic condition eligible for Prescribed Minimum Benefits (PMBs). Accordingly, defined diagnostic tests and the long-term medical management of the disease are covered in full by all medical aid schemes in South Africa. Medical aid schemes are allowed to insist that members with use designated service providers (DSPs) or network GPs, specialists, hospitals and pharmacies. They may also limit cover for chronic medication to a list of approved medicines, known as a medicine list or formulary. Formularies usually differ according to members’ levels of cover. Low-cost plans typically fund a limited number of generic medications, whereas more comprehensive medical aid products fund extensive formularies that include branded medications. To qualify for PMBs, members have to be officially diagnosed with chronic obstructive pulmonary disorder, and the the diagnosis and corresponding ICD-10 code must be submitted to the medical aid scheme. Associated treatment must then be pre-authorised. Many medical aid schemes also insist that members with chronic obstructive pulmonary disorder join an appropriate disease management programme. This allows scheme healthcare professionals to monitor the progression of the condition, review the use of prescribed medications from time to time and provide the requisite information and support. What diagnostic tests are covered by medical aid? 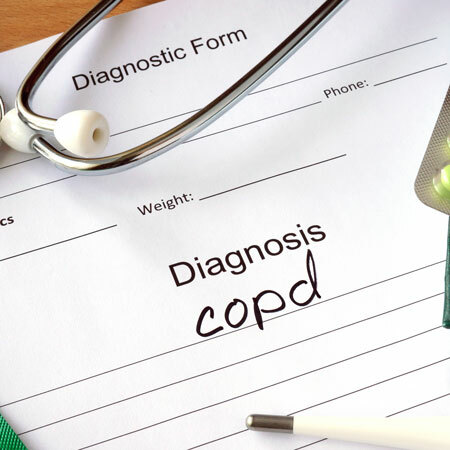 Chronic obstructive pulmonary disorder is identified using a range of diagnostic tests, such as a spirometry test, chest X-ray, CT scan of the chest, full blood count and a Body Mass Index (BMI) test. Cover for these tests varies among different medical aid providers and options. Medical aid schemes in South Africa provide members with full cover for prescribed medications that fall within the above medicine classes. However, the active ingredients, number of covered medicines, medicine names and classification of the medications (generic or branded) differ based on members’ plans. Typically a wider range of medicines is covered for members on higher-level, or more expensive, plans. The chronic medication benefit cap is also higher for the top-tier plans. Not all medical aid schemes offer the same level of chronic medication cover. Members in the most advanced stage of chronic obstructive pulmonary disorder will have to pay for oxygen treatment out of their own pockets, or from the existing external medical and surgical appliances day-to-day benefit. Choosing the correct medical aid scheme, option or plan is a complex task, particularly if you suffer from a chronic condition such as chronic obstructive pulmonary disorder. For expert advice on the best South African medical aid for you, contact an IFC consultant today.